KEN MADDOX, 78, of Paris, left this life peacefully on Monday May 5, 2008 at Paris Regional Medical Center. Starrett Funeral Home will conduct funeral services at 3:00 p.m. on Wednesday May 7, 2008 at First United Methodist Church, with Rev. Van Lazaroff and Rev. David Rucker officiating. Interment will follow in the Woodland Cemetery. The body will lie in repose at the church for one hour prior to the service. The family will receive friends from 7:00 to 8:00 p.m. Tuesday at the funeral home. Ken was born on July 31, 1929 in Medicine Mound, Texas, a son of Benjamin Franklin and Nettie Hightower Maddox. He attended schools in Hardeman County, then served in the U.S. Army from 1951-1953 during the Korean Conflict, serving much of his time in Goose Bay, Labrador. Following his military service he enjoyed the honor of serving as Post Commander of the American Legion post in Memphis, TX. Upon returning from military service Ken married Jackie Barkley and to this union were born two daughters, Vickie Diane and Debra Lea. 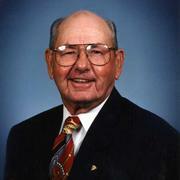 He made his home and career in the Borger, Texas area until 1974, when he moved to Lamar County, making his home with his mother in Woodland. On August 31st of that year Ken married Eleanor Vaughan Thomas and acquired four step-children whom he treated as his own: Eddie, Janie, Patti and Joy Thomas. Ken was a sales representative for MoorMan Manufacturing Company in Nacogdoches, Paris, and northwest Ohio. Upon retiring he continued with his first career choice, cattle ranching, until 1999. A lifelong Methodist, Ken was a member of First United Methodist Church and its New Era/Upper Room Sunday School class. He was preceded in death by his parents; his first wife, Jackie; six brothers, Porter, Linus, John, Ted, Frank and Jack; one sister, Ruby Goodnight; and one stepson, James Edwin (Eddie) Thomas. He is survived by his wife; daughters Vickie Ryan and husband Greg, of Big Spring and Debra Martin, of Springfield, MO. Also surviving are three granddaughters, Jennifer Lambillotte, Lindsey Lambillotte and Suzan Lambilllotte and husband Phil Mason. Also surviving to grieve his loss are Janie Thomas and husband Robert Young, of Coppell, Patti Jenkins and husband Shawn, of Carrollton and Joy Negron, of Kingwood; other grandchildren Kenneth and Sean Karl Negron and Sarah and Wesley Jenkins. Surviving brothers are Tom Maddox and wife Colleen and Stan Maddox and wife Edna, of Pinhook, and Bob Maddox and wife Kay, of Carrollton. Surviving sisters are Cecile Grange, of White Deer and Mary Ann Harris, of Burleson, along with numerous nieces, nephews and other extended family. Named to serve as casketbearers are Jerry Bailey, Ron Martin, Tony Hutto, Harlan Brown, Larry Carney and Andy Fasken. Honorary pallbearers are Steve Wright, Bobby Pratt, Mackey Charles, Leo Caldwell, Carl Cooper, Jay Bost and Gilbert Terry. If desired, donations may be made to First United Methodist Church – New Era Class or to Woodland Cemetery.